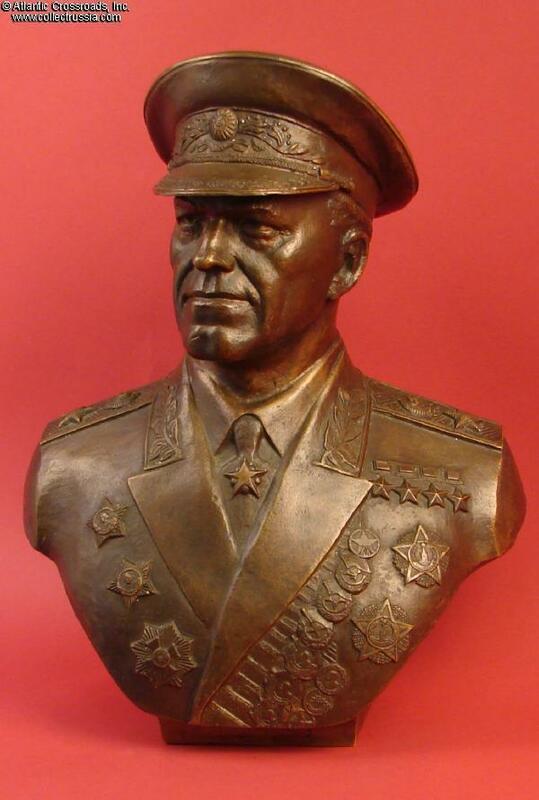 $270.00 Marshal Zhukov, large 10" tall bust in Silumin alloy, dated 1976. The conqueror of Berlin is shown dressed in service tunic with award ribbon bars and four Hero Stars. In excellent condition. To see other busts and sculptures of Dzerzhinsky, visit the Soviet Statuettes & Busts in Metal , section of our website. $95.00 Mikhial Frunze, bust in Silumin alloy with 1973 presentation engraving to a school by a group of students. $90.00 Marshal Voroshilov, bust in Silumin alloy with silver finish, dated 1979. Wearing an M 1935 Marshal's uniform and medals. For more Soviet statuettes & busts, please visit the Soviet Statuettes & Busts in Metal , section of our website. $30.00 Lieut. Gen. Mikhail Efremov, commander of Transcaucasian Military District, 1940. Uncommon portrait. Chose suicide over capture in 1942.